While the plaintive mews of a cat may endear him to his owner, excessive meowing, particularly during nighttime hours, can cause sleep loss and frustration for feline caretakers. 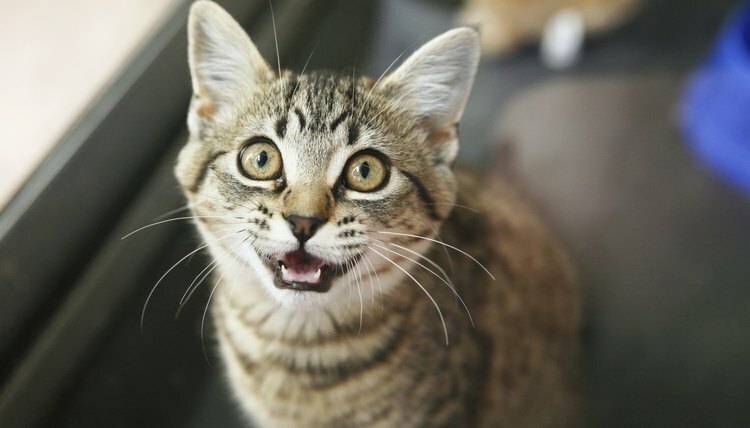 Meowing can be a friendly greeting, a request for food or attention, or the sign of a painful health condition. When a cat's meowing is incessant, concerned owners should contact a veterinarian to rule out any health problems. Cats learn to communicate with their owners when they have a need for affection or food. They may greet their owners upon coming home or to express enjoyment while in human company. Cats are nocturnal and may keep their owners awake by begging for attention. The American Society for the Prevention of Cruelty to Animals recommends feeding your cat a main meal just before you go to bed, as cats tend to sleep after a large meal. Engaging the cat in an active play session several times throughout the evening will serve to decrease her energy level at night, while providing a variety of toys and activities during the day will keep her busy and stimulated, encouraging her to rest at night. When cats experience a change in their living environment, they may become disoriented. Whether the family has moved or a new cat has been introduced to the household, changes such as these can cause increased vocalizations as cats adjust, according to the San Francisco SPCA. To help feline friends make a smooth transition, cat owners can introduce their pet to the new space gradually and ignore the meowing. The behaviors usually subside in a few weeks, when the cat feels comfortable in his new home. Concerned owners can contact a certified veterinary behaviorist for assistance with cats who won't stop crying. Certain breeds of cat are renowned for their vocal behavior. Siamese, Burmese, Tonkinese and oriental cats are known among cat lovers for their wide range of vocal expressions. Owners interested in peace and quiet can train their feline conversationalists to pipe down using treats to reward the cat when she's quiet. Yowling is utilized by cats to attract reproductive partners, according to the ASPCA. Intact cats yowl more frequently than spayed or neutered felines. Female cats may become increasingly affectionate during their heat cycle, which lasts between four to 10 days, and may meow throughout the cycle. Spaying females prevents this type of excessive meowing. Cats over the age of 10 may develop health abnormalities that cause excessive vocalization. Elderly cats may meow if they become disoriented, particularly at night. A night-light may help them navigate their territory if this is the case, according to Web Vet. Hypothyroidism, also seen in cats over the age of 10, often prompts cats to vocalize at night, as does kidney disease. When elderly cats begin complaining loudly and continuously, a trip to the veterinarian is in order.